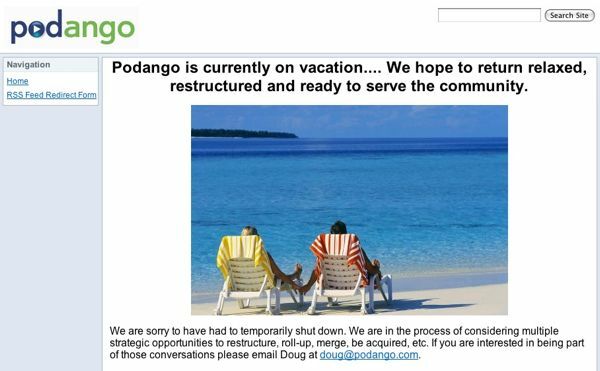 Late last year, podcast network and hosting provider Podango shut down rather abruptly. I hope this message finds you well. This email is to update you on Podango’s situation. You have repeatedly been generous to Podango, so I thought it couldn’t hurt to bring the situation to your attention. We are going to close the bidding pool on the 10th and move quickly to bidding, then closing. Interested parties should contact [Podango co-founder] Doug Smith (doug [at] Podango [dot] com). We tried to follow up with some more probing questions, but, 18 hours later, still haven’t had a response. With the bidding deadline zooming up, we thought we’d pass this scant information along to our readers. We’ll update you when and if we have more information. Sad to see – but nobody would want to buy the company after the killed the way they dumped everybody unceremoniously at the end of last year. Does he have some ocean-front property in Utah he’d like to sell as well? This is like having the plumber, the electrician, and the furnace guy showing up to do repairs during the real estate Open House for a home you’re trying to sell. It’s either ignorance pertaining to the outside perception of his business, or a search for greater ignorance to sell a bad investment to during bad economic times….you pick. Aside from the Podango Show Builder, which was purchased from GigaVox. Maybe the studio if it’s still in operation. The equipment might be worth purchasing.